To celebrate my friend, Gerry, having a cast removed from his arm, and also because we look for just about any reason we can find to drink some good wines and sample fine food, three of us headed to Worcester, PA on Rt. 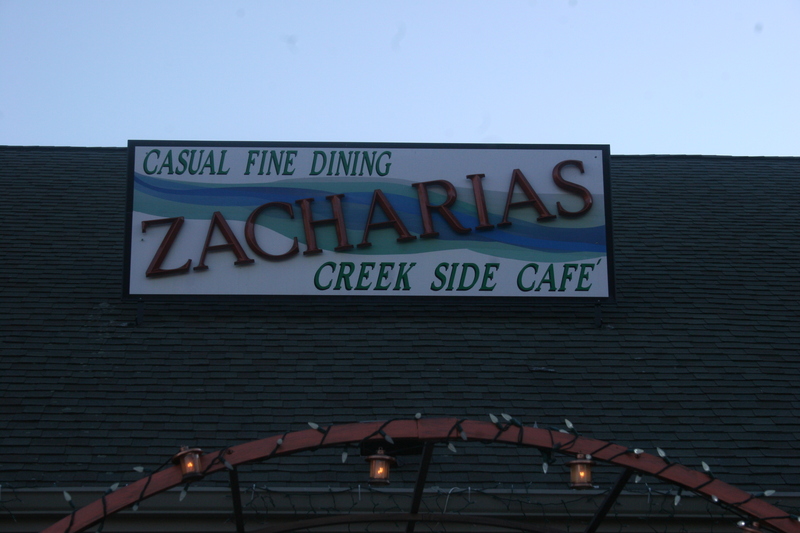 113 for dinner at Zacharias Creek Side Cafe this past Tuesday evening. What should have been an 18 minute ride from my office in King of Prussia took well over an hour as I fought the 422 traffic. After the torturous journey I was ready for some wine. As usual, we had some nice choices to sample. I had brought with me a 2004 Chateau Leoville las Cases, St. Julien. This wasn’t the greatest of years for Bordeaux wines but this one still managed to grab 95 points from the Wine Spectator and 93 from Robert Parker. Gerry, John and myself could not find it in our hearts to be quite that generous as we all felt this one didn’t quite do it for us. I think we’d probably come closer to a 90/91. Don’t get me wrong, it was fine, we just expected more. John’s 2007 Mollydooker Blue Eyed Boy, Shiraz was just as I had remembered from previous times; deep dark fruit mixed with hints of tobacco and chocolate, a great sipping wine . Gerry delivered the wine of the night with his 2008 Alpha-Omega Proprietary Red Wine. Gerry has become such a huge fan of everything Jean Hoefliger is producing at A-O that he has become an A-O Wine Club member. The Proprietary Red is a 50-50 blend of Cabernet and Merlot and it’s just silky smooth and rich in fruit, perfectly balanced with a 60 second finish. 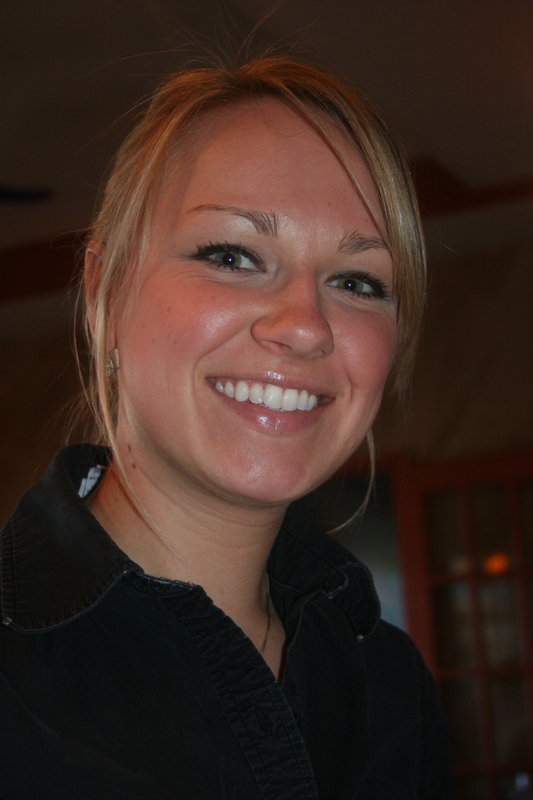 Speaking of silky smooth, our server for the evening, Alli, certainly fit that description. She displayed charm and professionalism all evening. She instinctively understood that we were not in any hurry and she allowed us all the time we wanted before ordering. She also made certain we had several glasses each so we could properly enjoy our wines. Thanks, Alli, you done good!! 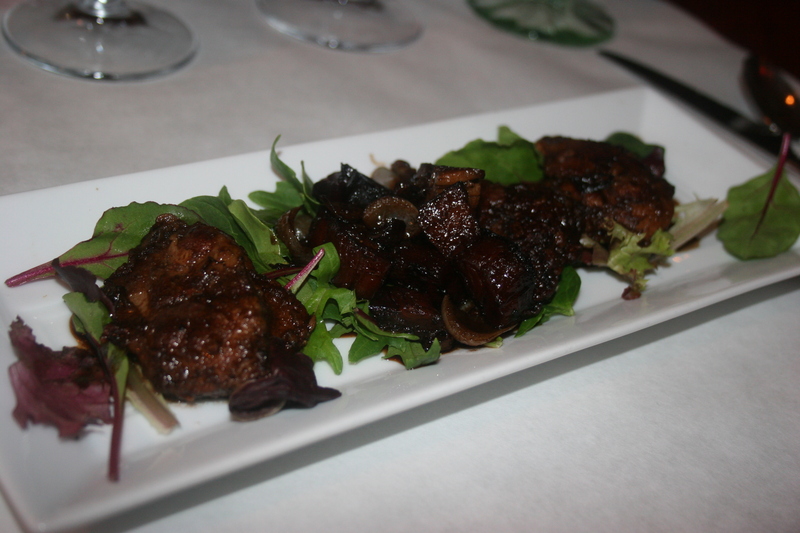 Zacharias Creek Side Cafe offers a Prix Fixe dinner Tuesdays thru Thursdays at $29.95. I was the only one of the three of us who opted for this choice. 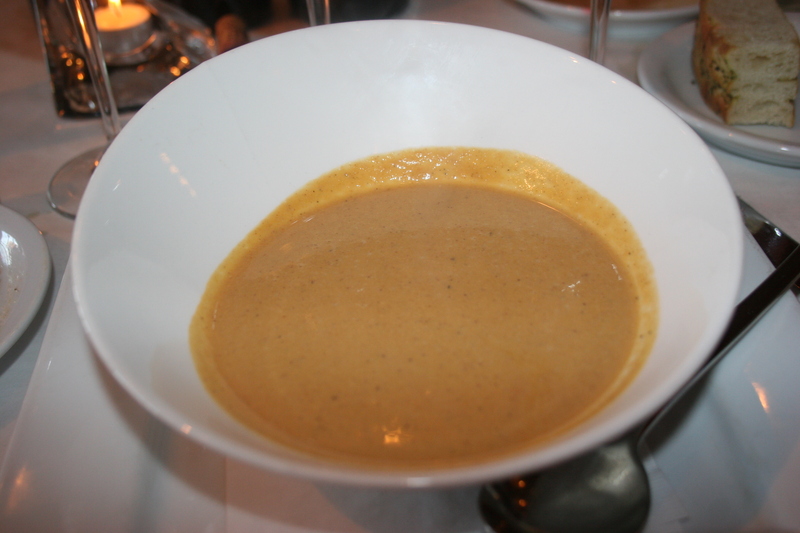 I started my meal with the Butternut Squash and Apple Bisque. It was served at the perfect temperature and the combination of fresh veggie flavor with the hint of fruit made a nice taste combination. Gerry and John went with some items that were a little more exotic for their starters. 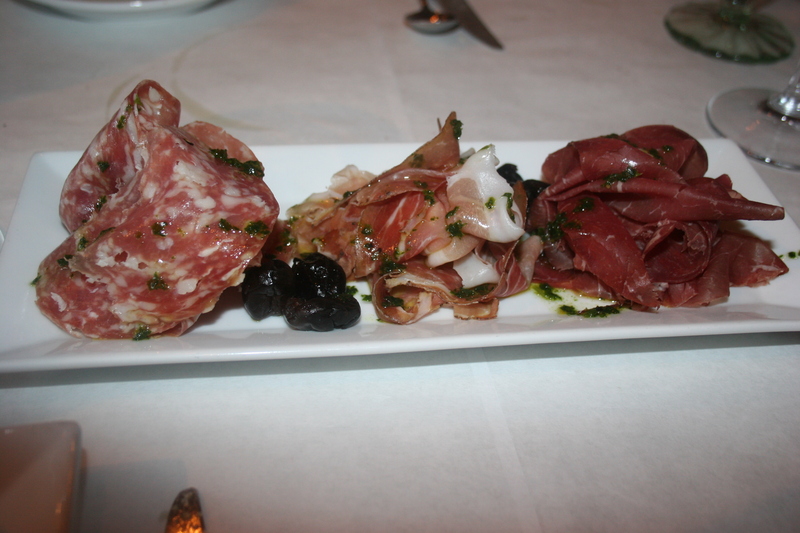 Gerry’s chicken livers were, I believe, a special of the evening and John’s plate of cured meats included prosciutto, bresaole and soppressata looked wonderful. I really should have tried some but I passed and that meant more for each of them. We conversed over our wines as we awaited our entrees. I was slightly limited in my choices as I has selected the Prix Fixe menu but there were certainly enough enticing items there to allow me to settle on a selection. 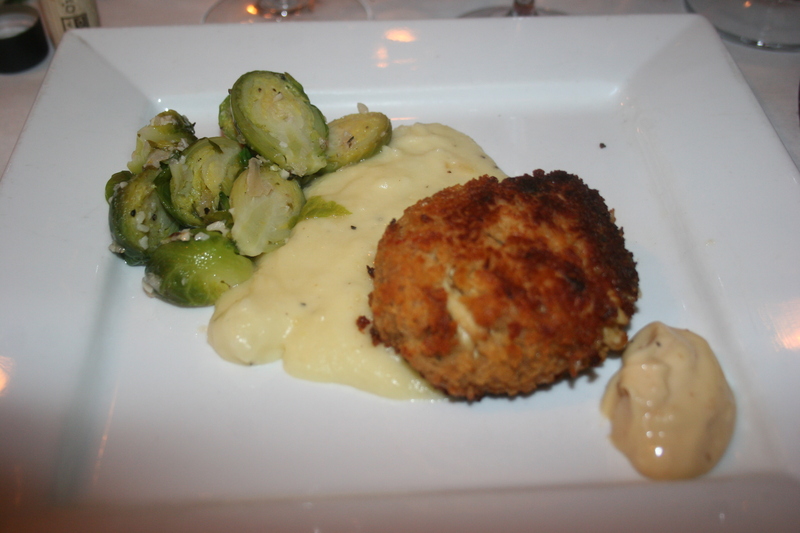 I went with the Jumbo Lump Crab Cakes served with potatoes and parsnip puree, brussel sprouts and roasted garlic aioli. The crab cake was filled with fresh meat and very little filling, the puree was a nice touch and the aioli brought out all of the flavor in the tender crab meat. I may have done better with a lighter wine than what we had with us but that did not deter from a very enjoyable entree. 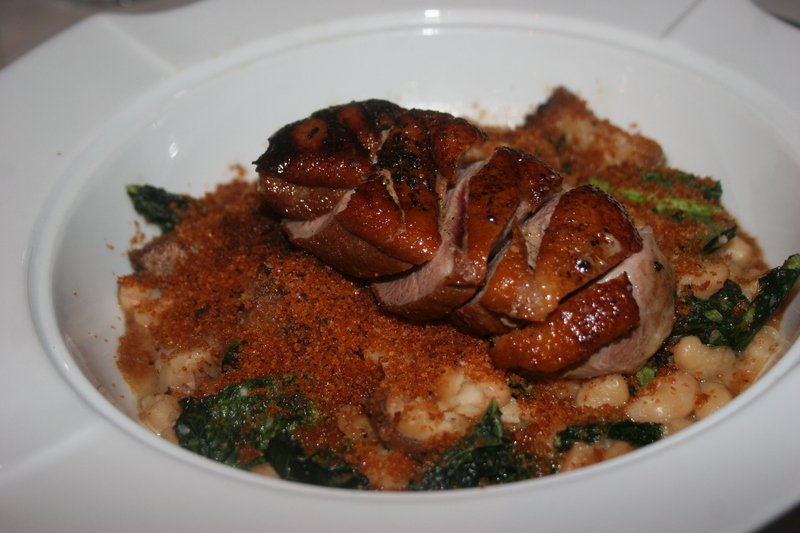 Gerry chose, from the regular menu, the roast duck. In looking at the menu now, I don’t see it listed so I wish I had jotted down what accompanied the dish because it all looked so good. It was not one of the specials, so I am a little bewildered as to why it isn’t listed on the current website menu. Anyway, he liked it but did mention there might be a tad too much salt in the dish. John was thinking like me and went with the jumbo lump crab cake except that he was craving a little meat with his meal and therefore had a four-ounce filet to complete his dish. 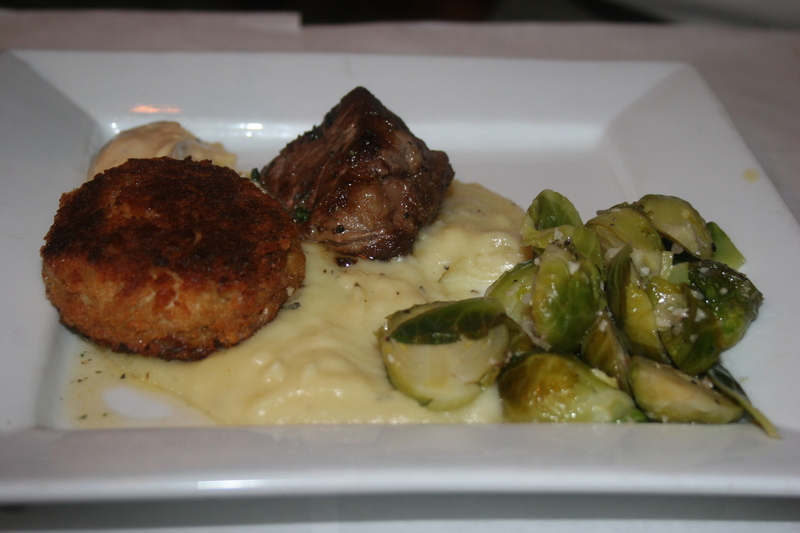 Both the crab cake and the filet were excellent and John had no complaints whatsoever. We still had some room for dessert and I was about to write that the desserts weren’t listed individually on the website so, although they were very good, I can’t adequately describe them…..BUT..I just had a flashback to Alli handing me a piece of paper so I went and dug out the shirt I wore that evening and there, in excellent penmanship, on the back of one of Zacharias red comment sheets, is a complete mouth-watering description of what we had for dessert. 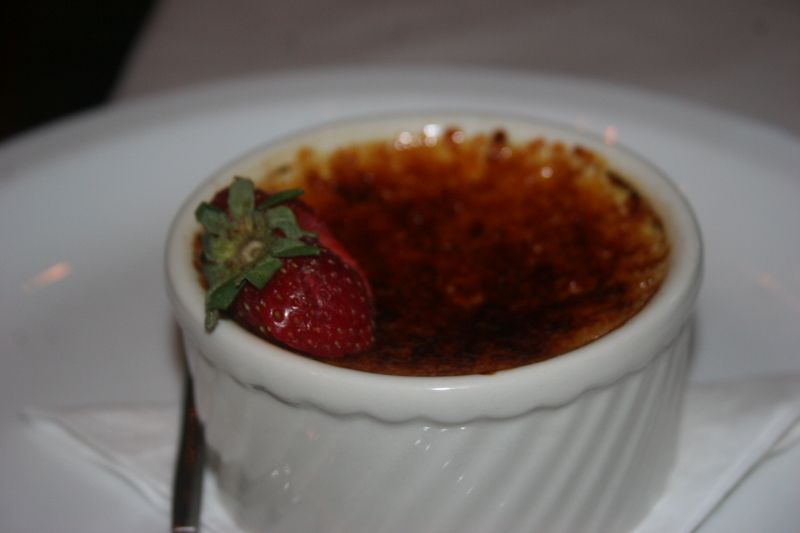 John had the Creme Brulee. It was fine. Gerry and I went a much more adventurous route. 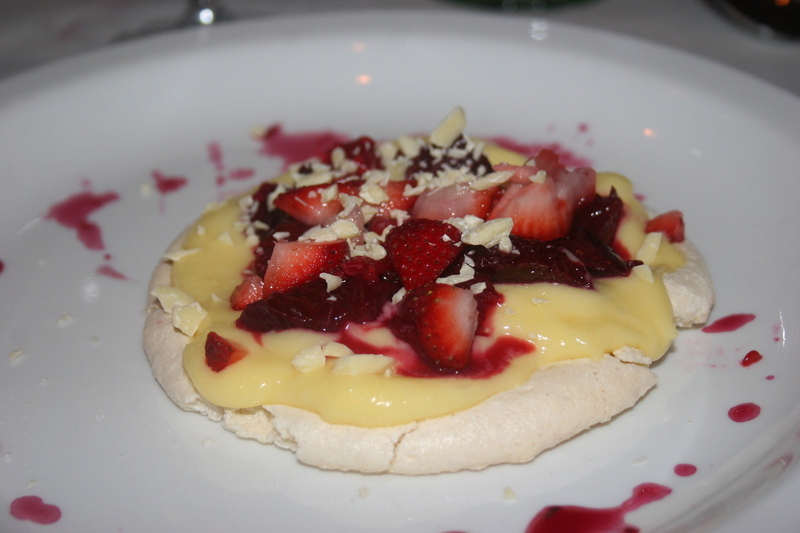 Here is Gerry’s Pavlova, almond meringue topped with lemon curd, blood orange and strawberry salad with white chocolate shavings and toasted almonds. Looked good, tasted better. 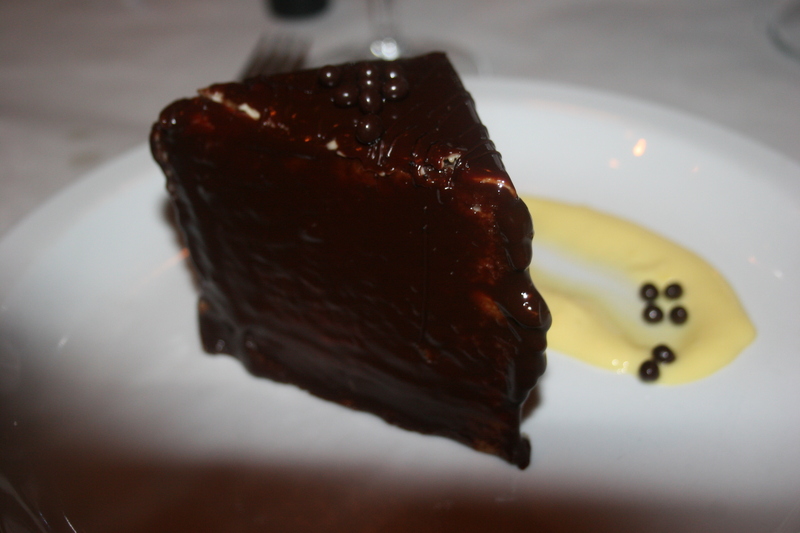 My little totally low-cal item was the white chocolate passion fruit mousse cake with a deep chocolate glaze. This one was perfect with the cup of coffee I had to conclude my meal. The three of us enjoyed our dinner at Zacharias Creek Side Cafe. Owner Andrew Gallo stopped by more than once to make sure we were enjoying our food. It is evident that he cares about what is being served and he has good reason to be proud of what he and his wife, Nancy, have created.